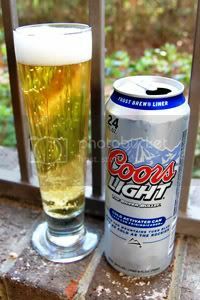 Introduced in 1978, Coors Light is the beer that really put the Colorado-based Coors Brewing Company on the map, and is by far their biggest seller. "The Silver Bullet's" brand image is all about the concept of Coors Light as the coldest beer. From the "frost brewing" process, to the ice-covered train featured in the commercials, and the fact that the beer is shipped across country in constant refrigeration; it's all about low temperatures. Coors has plenty of gimmicks to go along with the marketing talking points. Besides a vented mouth for speed, this can is equipped with both the "Frost Brew Liner" and the "Cold Activated" mountains. According to the can, the blue liner "locks in good taste," while the mountains will turn blue "at the peak of cold refreshment." Here I was thinking it was just an aluminum can. All of this has sparked a belief in many people that somehow Coors is a mystical, delicate beer, and must be kept cold at all times. They think if it is allowed to warm at all, its ruined. The power of marketing is strong, especially when it comes to light beers. Well, the mountains just turned blue, so let's dive in. Appearance: A pale golden body with a white head that recedes at a rate I've never seen, it destroys itself in mere seconds. Aroma: Thinner than thin, with only the barest whiff of grain. Blink and you miss it. Taste: Much fuller than the aroma would suggest, but still a very thin flavor profile. A sweet and grainy base with a little more "hop" flavor than most in this style. Bland, but better than many light lagers. Mouthfeel: As you would expect, light-bodied and fizzy with a dry finish. Drinkability: The only thing holding you back is the boring flavor profile. Verdict: Another very boring Light Lager, but quite probably the one I'd reach for from a cooler stocked with only Bud Light, Miller Lite, and Coors Light. It's not as skunky as Miller Lite and just a little bit better tasting than Bud Light. Coors Light is very refreshing. Just a plain light beer. What it has is ok. The problem is with whats missing.